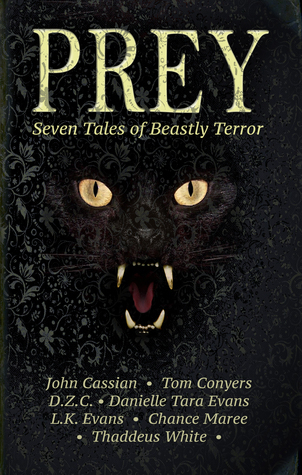 I just wanted to put out another reminder that Prey: Seven Tales of Beastly Terror is available on Amazon in both paperback and ebook (ebook reasonably priced at $2.99 US). All contributor proceeds will be donated to the World Wildlife Fund. It’s a great cause and I’d love help spreading the word. Here’s a little excerpt from my story, Chopin and Slacks, Chopin being a cat and Slacks the man who rescued him. It’s told from a Chopin’s point of view in first person. Be advised, this story contains cursing. “I could feel Slacks’ trepidation building with every hour. He cast furtive glances out the window and his normal composed demeanor grew fidgety. I watched all this unfolding from my spot on the kitchen island. He was on the couch, glass in hand. I was stupid enough not to listen. I gazed at him as though he was one of those aliens in the movies Brenden always watched. Run? Run from what? It was just the two of us. There was nothing sinister in the air. All that lingered was the oceany scent of halibut that he’d made us for dinner. Moonriver was playing. You can’t get much more tranquil than Moonriver. “Run!” Slacks growled through clenched teeth. Then I sensed it. I smelled it. I felt it. To this day I can’t listen to Moonriver. It brings back that horrid sight. The ghastly sounds. The stench of dog. I can’t really describe what happened accurately. It was like watching Brenden’s favorite movie, 300. Some seconds felt like hours, stretched out in slow motion, while others went by too quick, fast forwarding and making the scene pass in choppy movements. His shout of pain was chilling enough to freeze blood and the sound of his shirt tearing open seemed far too loud. I heard a grisly pop pop pop as his bones twisted into grotesque shapes. The stench of dog trumped the fishy smell of dinner as fur sprouted over his body. His fingernails stretched into horrible claws, curved and wickedly sharp looking. He fell to the floor, writhing, gasping for air, just like that fish did when I had knocked over its glass bowl. Slacks’ eyes were wide and brimmed with fear. Then the white bled out and only orbs of black remained. The rancid odor of evil pervaded my home. I ran. My paws slipped and slid on the wood floor and I left a trail of piss in my wake … maybe some other excretions, but we don’t need to go into details. I made it to the laundry room, skidded past the gap between the machines, scrambled to stop, and slammed into the wall. A high pitch howl came from the sitting room. It was both human and wolf. I wedged myself in between the washer and dryer and squeezed to the back where I hid behind the dryer. I realized I was growling low in my throat, my tail poofed like a Christmas tree. Another howl, this one more wolflike. I hope you give the book a try. A lot of great authors contributed to the cause, including two of my favorites: Thaddeus White and D.Z.C.